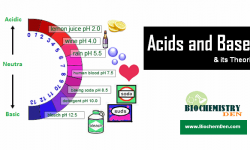 Glucose entering the TCA cycle is used for the biosynthesis of saturated fatty acids by converting TCA Cycle citrate to acetyl coenzyme~A (acetyl~CoA), and then malonyl~CoA, which is used to produce palmitate. The glycerol backbone of TGs comes from glycolytic glycerol-3-phosphate. Triglycerides are the primary lipid synthesized, and serve as a starting point for other lipids such as steroids and phospholipids. 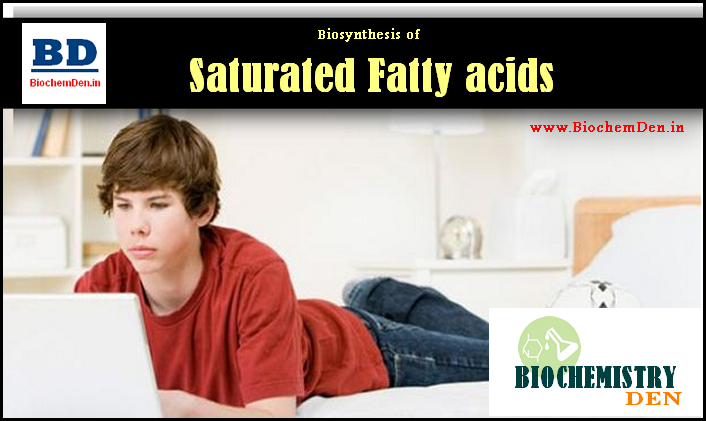 Biosynthesis of Saturated Fatty acids primarily occurs in hepatocyte cytoplasm. 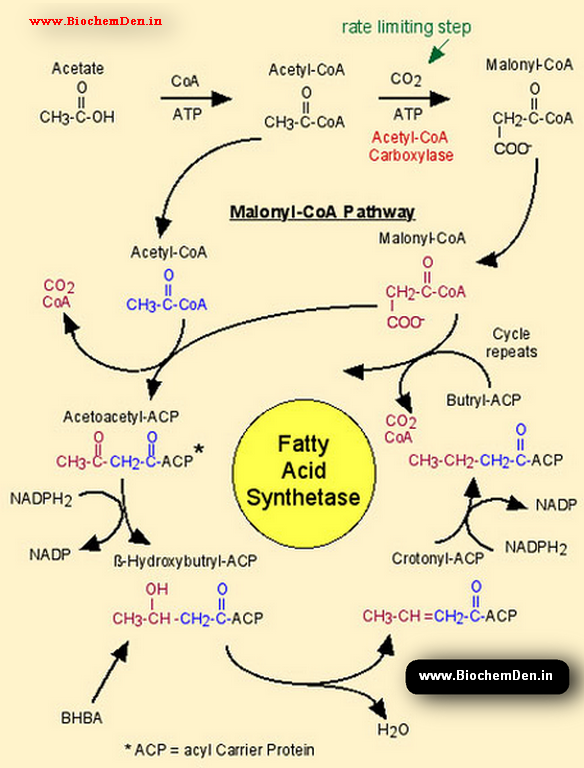 Acetyl CoA and NADPH are both necessary for Biosynthesis of Saturated Fatty acids. Coenzyme A consists of and chain made up of ADP, pantothenic acid, and triethanolamine, with an H2S group on the end which binds the acetate group of acetyl CoA. Acetyl CoA is produced in the matrix of the mitochondria, but fatty acid biosynthesis occurs in the cytosol. Citrate synthase frees CoA from acetyl CoA and condenses acetate and oxaloacetate to citrate. Matrix membrane transporters for citrate move citrate to the cytosol, where it is acted upon by citrate lyase in the presence of CoA to re-form acetyl CoA and oxaloacetate. The oxaloacetate produced is converted to malate, and then to pyruvate, which is transported back to the mitochondrial matrix. Acetyl CoA, with the addition of CO2, and with the hydrolysis of an ATP, is converted to malonyl CoA by acetyl CoA carboxylase (a biotin-dependent enzyme like all carboxylases). Acetyl CoA carboxylase (ACC) is, being the first enzyme in the fatty acid biosynthetic pathway, is a regulated enzyme. 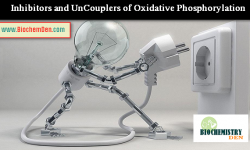 In the short term, allosteric activation by citrate, and allosteric inactivation by malonyl and palmitoyl CoAs, and covalent modification (phosphorylation and dephosphorylation) are the principal regulatory mechanisms. ACC is normally present as a tetrameric protomer (inactive form). The active form is the large polymer, which is favored by citrate binding and inhibited by malonyl and palmitoyl CoAs (products of the FA biosynthetic pathway). 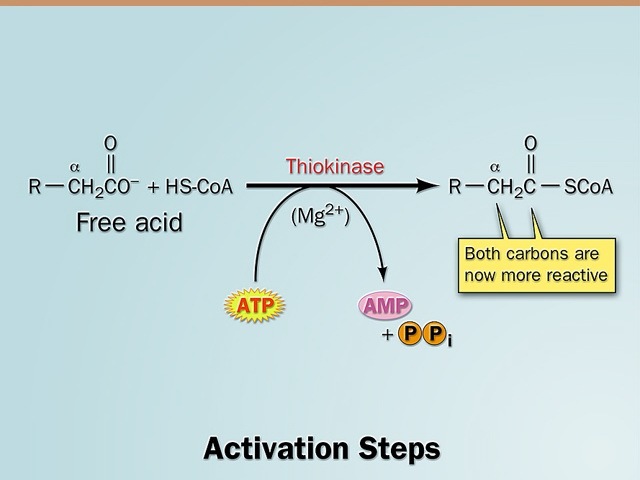 Phosphorylation is regulated by another mechanism, with glucagon and epinephrine activating PKA to phosphorylate (inactivate) ACC, and insulin activating phosphatase to re-activate the enzyme. The burden of long-term regulation is carried almost exclusively by up regulating the transcription of the enzyme itself. The sulfhydryl group of one ACP unit associates with the enoyl-ACP reductase (ER) subunit of another FASC complex, allowing dimerization of the protein. 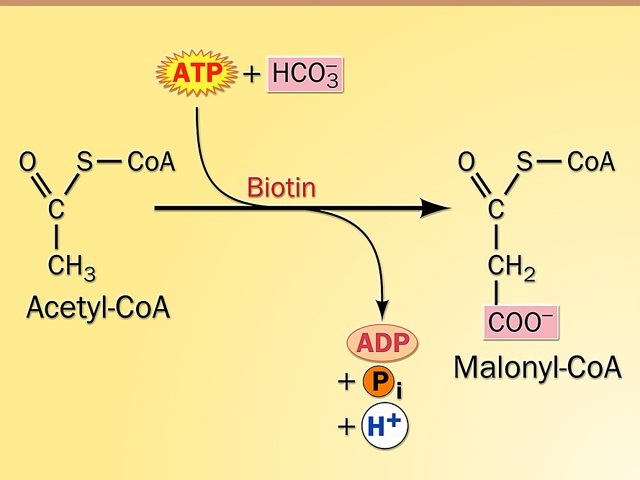 ACP assists in reactions by binding to substrate molecules, such as acetate (from acetyl CoA) and malonate (from malonyl CoA). 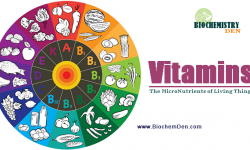 Any time a fatty acid is used in a biosynthetic reaction in the cell, it must be in the form of a fatty acyl CoA. Butyryl-ACP then enters into reaction 1 in the place of malonyl-ACP, undergoing the addition of another two carbons from acetate. 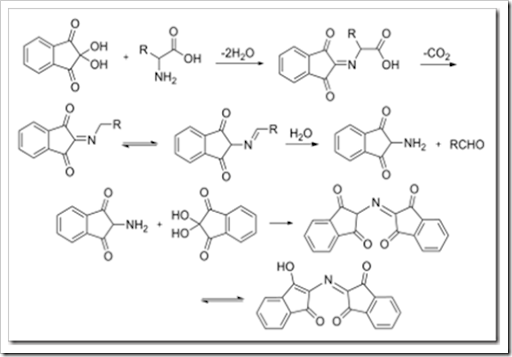 The overall reaction uses 8 acetyl CoA, 14 NADPH, 14 H+ and 1 malonyl CoA to produce a 16-carbon palmitic acid. FASC produces palmitic acid (16C). In the endoplasmic reticulum, two-carbon units can be added to palmitate from malonyl CoA. In the mitochondria, two-carbon units can be added to 8C fatty acids from acetyl CoA, but only to the extent of 14C fatty acids.